Welcome to this year's 42nd issue of DistroWatch Weekly! Our readers tend to be curious people, investigating new technologies and discovering new ways of doing things. Keeping that inquisitiveness in mind, this week we explore a variety of technologies, talking about reasons to try flavours of BSD and porting an operating system between computers in our Questions and Answers column. We also take quick looks at two Linux distributions this week. First, we talk about Reborn OS, an Antergos-based project with several special features, and then review Nitrux which focuses on using portable packages on a custom desktop environment. Our Feature Story has more details on these two ambitious distributions. 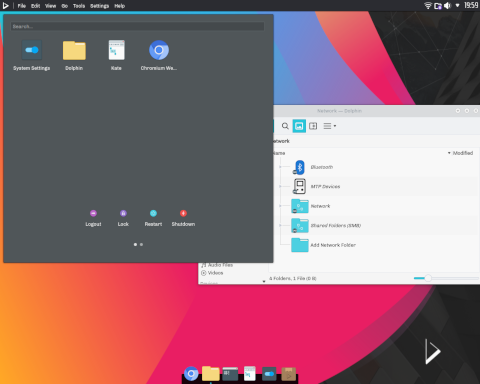 In our News section we discuss feren OS experimenting with an edition featuring the KDE Plasma desktop, a Linux patch which may offer great power savings across multiple CPU architectures, and we talk about the benefits of Linux-based firmware. This week our Opinion Poll touches on Linux user groups (LUGs) and asks if any of our readers are members of these computer clubs. Plus we are pleased to share details of last week's releases and provide a list of the torrents we are seeding. We wish you all a fantastic week and happy reading! Listen to the Podcast edition of this week's DistroWatch Weekly in OGG (22MB) and MP3 (16MB) formats. Reborn automatically launches the Cnchi graphical installer, a component it borrows from Antergos. The installer lets us know it requires a network connection to download the latest available packages. The installer also insists we have at least 8GB of free disk space for the operating system. I had both of these and so proceeded. Cnchi walks us through selecting our language, location and time zone. We are then given a chance to select what kind of user interface we want. There are a lot of options, ranging from KDE, GNOME, i3 and a console only setup. We can also install Budgie, along with other popular desktops and something called Windows Interface, which looks like it might be GNOME with Zorin's Windows 7 style theme. Unfortunately we can only select one desktop to install. I decided to go with Budgie, since it seemed to be the distribution's default. We are then asked to select which optional features we would like. There is a long list of items we can toggle to enable or disable, including the Chrome web browser, Bluetooth support, Firefox, Dropbox, Flash, LibreOffice, Mycroft, Redshift, WINE, VLC and WPS Office. The Anbox software for compatibility with Android apps was mentioned on the website, but not listed as an optional feature in the installer. We are then given the chance to manually select package mirrors or have the installer do it for us. Taking the automatic mirror selection takes a few minutes during which the installer appears to lock up. Disk partitioning comes next and we can choose automated or manual partitioning. I noticed the ZFS storage volume option was disabled in Reborn's version of Cnchi, otherwise the options are the same as on Antergos. The last step is to create a username and password for ourselves. Here the installer failed, reporting it had run into error zero, which the Reborn website says is a common problem that happens when a package cannot be found or downloaded. There is a manual workaround suggested, but the problem is the workaround assumes the installer is failing to download a specific package. In my case the installer was failing before that, while apparently trying to download a manifest of available packages. To make matters worse, the installer exits when it encounters error zero, forcing the user to go through the entire configuration process again. I went through the installer a few more times, after confirming I had a working and stable Internet connection. Each time the installer failed with the same error and quit, whether I used automatic mirror selection or manually picked mirrors myself. Since Reborn could not install, even after multiple reboots and trying different package selections, I gave up and moved onto another project. Update: After writing this review I corresponded with one of the Reborn OS developers about the installer bug. They believe the issue has been corrected, but I have not yet had a chance to confirm whether their fix works. 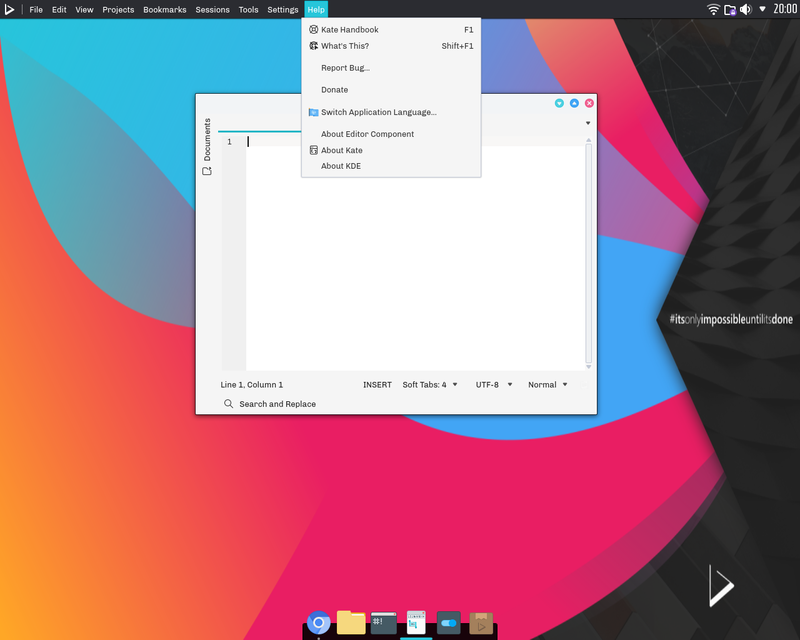 Nitrux is a Linux distribution based on Ubuntu suitable for laptops and desktop computers. Nitrux provides all the benefits of the Ubuntu operating system combined with a focus on portable, redistributable application formats like AppImages. While based on Ubuntu, Nitrux trims down the list of applications installed by default. Only a small collection of desktop software is included. The distribution uses a customized version of the KDE Plasma 5 desktop, called Nomad. The download for Nitrux was 1.5GB in size and I found the distribution is available for 64-bit computers only. Booting from the project's live media brings up the Nomad desktop. A panel at the top of the screen holds the application menu and system tray. A single icon on the desktop launches the system installer. A dock at the bottom of the display provides quick-launch buttons for commonly accessed applications and also doubles as the desktop's task switcher. My initial impression was the desktop, with its brightly coloured wallpaper, was working and I immediately opened the system installer. Unlike its parent distribution, Nitrux does not use the Ubiquity installer. Instead Nitrux uses the Calamares installer. Calamares is quite easy to navigate and makes selecting our time zone, keyboard layout and making up a username/password combination straight forward. We can opt to have the installer set up disk partitions for us (which will result in a ext4 partition for the operating system and a small swap partition), or we can manually set up file systems. The manual partitioning option is quite easy to navigate. The installer then copies its files to our local hard drive, completing its work quickly. While the installer was working, my screen locked and asked me for a password to get back to the desktop. The password for the live environment is blank. Something else I noticed at the end of the process was, when we reboot the computer, Nitrux will appear to lock-up when powering off the system. I found out the operating system had not crashed, it had merely paused and (I suspect) displayed a message asking for the install media to be removed, but if there was a message it was displayed as white text on a white background, making it invisible and the system seem unresponsive. Pressing Enter got things moving again and the computer restarted. My freshly installed copy of Nitrux booted to a graphical login screen where I could sign into the Nomad desktop. When running in a VirtualBox test environment, the login screen was unusually slow to respond to input, but performed quickly when run on my desktop computer. In a similar fashion, the Nomad desktop proved to be slightly sluggish to respond in VirtualBox, but ran smoothly on physical hardware. I was pleased to find the desktop automatically resized itself to match my host computer's screen resolution when run from a virtual environment. Nitrux took up about 4.4GB of disk space for a fresh install and consumed about 510MB of RAM when logged into the Nomad desktop. All in all, the resource usage and performance of Nitrux running Nomad appears to be about the same for me as running most Linux distributions with the Plasma desktop. Once I got signed in and started looking around the Nomad desktop, a few key characteristics popped out. One is that the application menu, located in the top-left corner of the screen, presents launchers in a small grid. The menu, which is a custom widget called Nomad Menu, is divided into two pages, one for favourite/popular items and one for all installed applications. I tried swapping out the Nomad menu for a classic tree-style menu and not only did the alternative menu not appear, but the Nomad Menu button disappeared too. This left me temporarily without an application menu until I tracked down a solution. Another feature of Nomad is the dock at the bottom of the screen. To avoid taking up too much space, the dock gets hidden behind application windows. However, if the mouse pointer gets close to where the dock is, it pops-up, hiding the content behind it. I found this a frustrating arrangement as it meant I couldn't, at a glance, see which windows were open, but it also meant that if I was working on something near the bottom of a window it would get covered by the dock. Nomad uses a global menu bar at the top of the screen. This means our application windows do not have their own menus, whichever window is active displays its menu in the top panel. Some people like this, some don't, and I fall into the latter group. I tried to remove the global menu to restore in-window menus, but the steps to do this in Plasma do not work in Nomad. I then tried to remove the default panel and replace it with a custom Plasma panel of my design, but found it is not possible to remove the Nomad panel. Going into the panel settings and trying to remove it does nothing. I could create as many new panels as I wanted and arrange them as I liked, but never remove the default one. I couldn't find a way to move the default panel either though moving new panels I created was straight forward. Since I am talking about adjusting settings and widgets I think it is worth talking about the desktop settings panel. Nomad appears to use a nearly unaltered copy of the Plasma System Settings panel. This gives us access to a wide range of themes, looks, window behaviours and the chance to adjust visual effects. I think a few minor items dealing with themes and the KWin window manager were missing, or maybe Nomad is just using an older version of the Plasma settings panel. The controls which were present all worked well for me. Of all the features in Nitrux, I feel the Nomad Software Centre probably deserves the most attention. Nitrux makes a point of being geared toward portable software packages, AppImages in particular, and the Software Centre reflects this. The software manager displays available AppImage packages in a grid, listing just their name and a truncated version number. There are no descriptions or icons associated with the packages and we cannot get more information about them by clicking on them. The packages are shown in alphabetical order with no method, so far as I could find, for sorting them into categories. We can search for packages based on their name, but otherwise we are left with a long list of packages with short names like "jaxx" or "xchat" without context. Each package has a "Get" button associated with it and clicking "Get" appears to do nothing for a minute or so, and then the button changes to say "Remove". New applications do not appear in our application menu and are not added to our path and I began to wonder if the items I had selected were downloaded at all. After some digging around, I found AppImage programs can be located in one of two places. In our home directory there are two folders, Applications and bin. The former holds programs added to the system at install time, as far as I can tell, and the bin directory holds programs installed from the Nomad Software Centre. Neither of these locations was a part of my user's path, which meant I had to open a terminal and explicitly run the newly installed items using their full path name. As far as I could tell, there does not appear to be any method in place to upgrade packages. Perhaps this happens automatically in the background, but I could find no method for checking on potential AppImage updates and downloading them. For me, installing large, portable versions of packages which are (for the most part) already available in Ubuntu's repository and which will not be added to my menu or path seems like a big step backwards. I probably would have overlooked the inconvenience of this approach had there been another software centre, like GNOME Software or Discover, on the system, but to deal with Ubuntu's underlying packages we need to use the APT command line tools. The one aspect of working with portable packages I did like was AppImage packages did not integrate with the Nomad desktop. Basically this means that any program we install via AppImages cannot use Nomad's global menu bar and instead has its own, in-window menu. There is a touch of irony in that AppImages not working with the Nomad desktop provided me with programs which presented themselves in the manner I wanted. 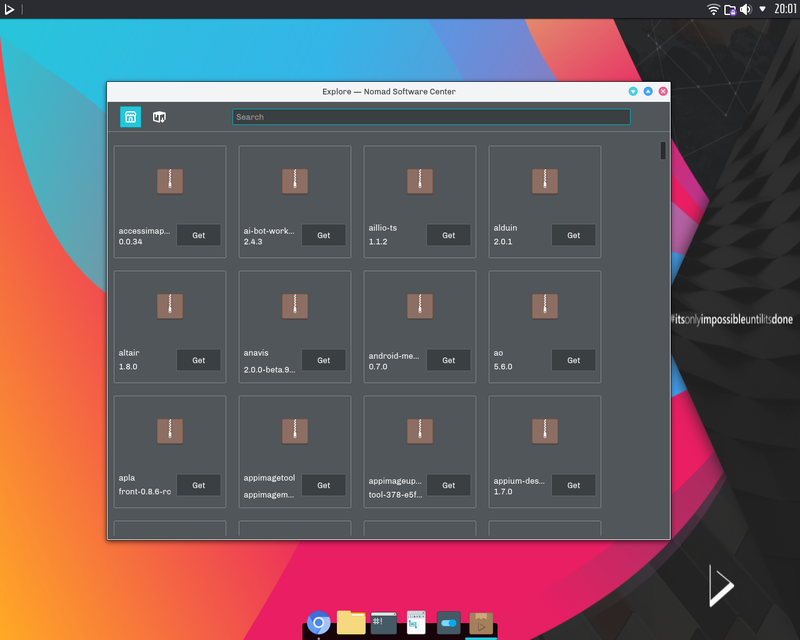 Nitrux ships with a minimal collection of software. In the application menu we find the Chromium web browser, the VLC media player, the Babe music player and the qpdfviewer document viewer. Media codecs are included for playing videos and music. The Dolphin file manager is included along with the Kate text editor and a calculator. In the background I found the GNU Compiler Collection, the systemd init software and version 4.18.5 of the Linux kernel. The included software worked well and I had no problems with the default applications. I went into my experiment with Nitrux optimistic that the reports I had been given that the distribution had changed and improved would prove to be true. To the developers' credit, Nitrux has matured over the past year. The last time I tried Nitrux it failed to work with my desktop computer, even though its parent (Ubuntu) ran smoothly on the same equipment. Now Nitrux runs well on my workstation, so hardware support has improved. In the past I questioned the wisdom of swapping out Ubuntu's friendly Ubiquity installer for an alternative. While Nitrux still uses a different installer (Calamares), I have to say Calamares is just about on par with Ubiquity these days so the choice to use an alternative did not have any negative side effects for me. Previously, when I tried Nitrux I did not like the default audio player. I think the Babe audio player has come along nicely. While it might not be my first choice for a music player, it gets the job done and worked much better for me during this trial. I did run into some design choices that frustrated me. The first being that Nomad seems to be basically the Plasma desktop with some hard-wired choices made for us. I like the Plasma desktop and greatly appreciate its flexibility. To run into fixed features I didn't want (such as the global menu bar I couldn't remove) in a Plasma-based environment somewhat soured me to the experience. This is all the more unfortunate because some of Nomad's style and approach I liked, but being unable to tweak it to better suit my workflow left me wanting to swap out Nomad for plain KDE Plasma. My biggest issue with Nitrux though is the software manager. Instead of having a rich and easy to browse software manager like GNOME Software or mintInstall (or a powerful package manager like Synaptic) the distribution uses a custom software manager that only works on AppImages. This not only limits easy access to Ubuntu's massive package repositories, it also makes searching for packages harder. There are some other possible side effects too. For instance, AppImages are a mixed bag when it comes to security updates. Ubuntu's main repositories get regular security fixes, but AppImages may or may not depending on the specific package's maintainer and there isn't much the user can do about that. Another concern I had was that each AppImage is installed in the user's home directory, not a central location. This means on computers with multiple users we may end up with the same AppImage installed multiple times as each user gets their own copy. AppImages are relatively large so it may become a storage issue as well as a security concern. Finally, AppImages are not added to the application menu so the user needs to be able to find and manually run their newly installed programs and this seems like a lot of unnecessary fiddling about when most software managers add new programs to the menu for us. To be fair, I like AppImages, I use them sometimes myself. But I feel they work best when used sparingly as an add-on to the distribution's default repository, not as a replacement. It's helpful to have an AppImage when we need a newer version of a package than what is in the repositories, or a program that hasn't been added to our distribution, but it is not a convenient method for doing day-to-day software management. While Nitrux does some things well - it is easy to install, desktop performance is good, the default layout is nice and fairly clean - after a few days I was reminded of something I wrote about the distribution last year. "This style of approach seems to be repeated throughout the distribution: replacing working utilities (music player, system installer, software manager, application menu) with alternatives that do not function as well as the ones provided by the parent distribution." I believe the same description applies today. By the end of the week I wanted to replace Nomad with the more flexible Plasma, replace the software manager with Ubuntu's GNOME Software, replace the dock with a classic task switcher. All the customizations and special features Nitrux introduces I wanted to undo to get back to a more mainstream, arguably more convenient set of tools. It's not that Nitrux introduces poor ideas, but that it replaces existing good tools with its new ideas which haven't matured to the same levels as the items being replaced. I would probably like the new software manager if it were an add-on alongside another package manager, like Discover. I might enjoy the Nomad menu and panel if I could customize it as I can any other Plasma widget without my application menu vanishing. In short, I think Nitrux's custom tools make good additions to the Ubuntu base, but not good replacements for more mainstream utilities. Nitrux has a visitor supplied average rating of: 8.3/10 from 44 review(s). Have you used Nitrux? You can leave your own review of the project on our ratings page. The feren OS project has previously released editions featuring the Cinnamon, MATE and Xfce desktop environments. 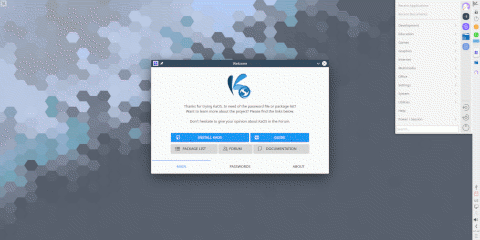 This past week the project announced an experimental spin featuring KDE Plasma and based on Ubuntu's 18.10 Beta release. "Another new build for experimental ISO of feren OS is now available, showing the early workings of what feren OS could be like with the KDE desktop environment. Note that what you see in the ISO is nowhere near the finished product, with a lot of change planned over time, some of which will potentially make the experience as a whole feel different, and all the ISO is right now is the accumulation of the default settings and experience for KDE being put in the OS. This means that the ISO is nowhere near the final product still." More details on this experimental spin can be found on the project's blog. Next, we are happy to share some good news for all Linux users. Developer Rafael Wysocki recently gave a talk in which he discussed what a computer's CPU is doing when the operating system is idle. As it happens, a lot goes on in the background to try to make CPUs energy efficient when the operating system has no tasks to perform. Wysocki made some adjustments to the way Linux handles idle periods on all CPUs and came up with a way to greatly improve energy saving. "As Wysocki put it, this new scheme predicts short idles less often than the old scheme did, but it is right about them being short more often. In response to a question from the audience, Wysocki said that the work is architecture-independent. Intel CPUs will benefit from it particularly, because they have a comparatively large array of idle states from which the governor may select, giving the governor the best chance of doing well if it predicts correctly; but ARM CPUs, for example, will also benefit." The LWN article suggests the new approach could improve power saving on CPUs running Linux by about 20%. This, in turn, means Linux machines with Wysocki's improvements should run cooler. Another victory for open source enthusiasts was mentioned in It's FOSS. The It's FOSS article talks about a project called LinuxBoot which provides an open source alternative for proprietary UEFI firmware. The LinuxBoot firmware gives administrators the ability to update or customize their systems without waiting on a vendor to release updates. The open source firmware can also be audited for security purposes and can offer significant improvements in boot times: "Here are some of the major advantages of LinuxBoot over UEFI: Significantly faster startup - it can boot up server boards in less than twenty seconds, versus multiple minutes on UEFI. Significantly more flexible - LinuxBoot can make use of any devices, filesystems and protocols that Linux supports. Potentially more secure - Linux device drivers and filesystems have significantly more scrutiny than through UEFI." Further details can be found on the LinuxBoot website. Looking-to-try-something-new asks: I have been using Linux since a few years, currently on Arch, and have heard about BSD. Is there anything that BSD does better that would make a Linux user like me want to use it instead? DistroWatch answers: One of the tricky aspects of comparing Linux distributions with the various BSDs is the amount of diversity in each community. There are hundreds of Linux distributions and around two dozen BSD variants that I am aware of. Given the range of styles, goals and communities of each project, it is hard to speak in generalizations. For instance, I could say that most of the BSDs are not geared toward desktop usage, but there are key exceptions like GhostBSD and TrueOS which specifically target desktop systems. Since you are running Arch Linux I will try to do my best to compare it against the big names in the BSD community: FreeBSD, OpenBSD, DragonFly BSD and NetBSD. I think one feature you will appreciate about the BSDs, coming from Arch, is the level of documentation. Both Arch and most of the BSDs are famous for having detailed, correct documentation on just about every subject. Like Arch, the mainstream BSDs typically do not set up a desktop environment (or many services) by default. Coming from Arch, you will likely be at home with the typically minimum BSD base operating system. Likewise, if you have used Arch's AUR to install community-supplied software, you will probably feel at home with the BSD style of package management. The BSDs separate most applications into a third-party repository where you can install software from binary packages or source code. Putting aside the similarities you are likely to run into, let's look at some reasons you might want to switch. The mainstream BSDs tend to be more conservative in introducing changes to the core system. If you have ever felt that Arch was changing too quickly for your taste, the BSDs will seem calm and conservative in comparison. The BSDs usually have a slow moving core system with up to date end-user applications. The BSDs are developed as a whole operating system, while GNU/Linux distributions are collections of components from separately maintained projects. This means the programs in a core BSD system tend to work well together and not break during upgrades as they are all developed and tested together. In a similar fashion, the documentation tends to be well organized and consistent. The FreeBSD operating system, and its children, have built in ZFS support which can be very useful for large collections of data, network storage systems and taking snapshots of the operating system for safe keeping. There are just two things I can think of which may make you want to stay on Arch and not try a flavour of BSD. The first is application support. Most Linux software will work on the BSDs, but some components, particularly closed source applications, will not. If you run Steam or Chrome, then the BSDs are probably not a good fit for you. Hardware is another area where I often run into problems with the BSDs. The BSDs tend to lag a little behind Linux in getting hardware drivers, so if you're using exotic hardware or a very new computer then the BSDs may not support your equipment yet. My suggestion is to try a couple of the BSDs in a virtual machine and see what you like about them. That way you can become familiar with their way of doing things before you take the plunge. You may also want to start with a newcomer-friendly flavour of BSD such as GhostBSD. It ships with a pre-configured desktop and graphical package management to help ease you into the experience. Moving-hard-drives-between-computers asks: I have a computer with Fedora installed on the 250GB hard drive. If I take this drive and place it into a new computer, will I be able to boot it up without issues? DistroWatch answers: You can probably take the hard drive out of the old computer and place it into the new machine and boot from it. Once you have made the migration you may need to make a few minor adjustments. For example, you may find you need to re-configure your wireless network connection if the operating system assigns a different name to the new computer's network card. Likewise, you may find yourself changing your screen resolution if the new computer has a different sized screen. While migrating a hard drive from one computer to another will usually work, there are some potential hurdles you should be aware of. The two computers should have the same CPU architecture. For example if your old computer was a 64-bit x86 system, then the new computer should also be a 64-bit x86 system. If the new computer is running an ARM processor then your operating system will not boot. Likewise, if your old computer had two hard drives and had the boot loader on another disk, putting your distribution's hard drive into the new computer would not work because the boot loader would be missing. These rare cases aside, swapping your disk out of one computer and into another should not be a problem when running Linux. The kernel and most low level components are pretty forgiving when the system's hardware changes. Proxmox is a commercial company which offers specialized products based on Debian. The company recently launched Proxmox Mail Gateway version 5.1 based on Debian 9 "Stretch". "Proxmox Mail Gateway 5.1 comes with Debian security updates, new features, bug fixes, and GUI improvements: The new Transport Layer Security (TLS) policy provides certificate-based authentication and encrypted sessions. Users can now set a different TLS policy per destination domain, in case they need to prevent e-mail delivery without encryption, or to work around a broken STARTTLS ESMTP implementation. Configuration of the TLS policy can be done via GUI. TLS is also possible on internal SMTP port/traffic. The updated user management now allows a new help desk role enabling help desk staff to access the quarantine. Proxmox Mail Gateway 5.1 supports SMTPUTF8. This will fix the problem with some non delivered Google mails. Smarthost ports: Editing and showing smarthost port is possible. On the web-based user interface, the Proxmox developers improved the Spam Quarantine section adding keyboard shortcuts (for Whitelist, Blacklist, Deliver, and Delete), allowing contextual menus with right click, and enabling multiselection of emails. Graphs and reports on the GUI have been optimized in Proxmox Mail Gateway 5.1." Further information can be found in the company's press release. The UBports project maintains a community-developed continuation of Canonical's Ubuntu Touch operating system for mobile devices. The UBports team has published a new update, based on Ubuntu 16.04. The new release, UBports OTA-5, includes several bug and stability improvements. The update also features a new web browser. "The old Oxide web engine 'Browser' app is being replaced by our new QtWebEngine browser, Morph (formerly known as browser-ng). 'Morphing' the browser to QtWebEngine means that the code will have upstream benefits from the Qt company, and it uses a more recent version of the Chromium engine as its base. This should resolve a number of browser issues, and make use of new scaling features. Morph Browser takes advantage of Qt Automatic Scaling, so that the websites you visit look the way that they are supposed to no matter what form factor you are using." Further details can be found in the project's release announcement. A list of supported devices and installation instructions can be found on the project's Devices page. Lucas Holt has announced the availability of MidnightBSD 1.0, a new stable release of the project's FreeBSD-derived operating system with a goal to create an easy-to-use desktop environment with graphical ports management and system configuration: "I'm happy to announce the availability of MidnightBSD 1.0 for amd64 and i386. Over the years, many ambitious goals were set for our 1.0 release. As it approached, it was clear we wouldn't be able to accomplish all of them. This release is more of a natural progression rather than a groundbreaking event. It includes many updates to the base system, improvements to the package manager, an updated compiler and tools. Of particular note, you can now boot off of ZFS and use NVME SSDs and some AMD Radeon graphics cards support acceleration. AMD Ryzen support has greatly improved in this release. We also have added bhyve from FreeBSD. The single largest removal of functionality was the sensors framework. We found that there were some locking issues that couldn't easily be addressed without some major work. Sudo was removed from the base system and replaced with doas(1) from OpenBSD." See the release announcement and release notes for further information. KaOS is a rolling release, desktop Linux distribution that features the latest version of the KDE desktop environment. The project's newest snapshot, KaOS 2018.10, features KDE Plasma 5.14.0 and offers improvements to Croeso, a welcome screen that helps customize the operating system when the user first logs in. "Plasma 5.14.0 was announced just a few days ago and is already included in this ISO. Highlights of this version include a new Display Configuration widget for screen management which is useful for presentations, the Audio Volume widget now has a built-in speaker test feature moved from Phonon settings, Plasma now warns on logout when other users are logged in, fixed non-centered task switchers on Wayland and the Kickoff application menu now switches tabs instantly on hover. A new Glibc 2.27/GCC 7.3.1 based toolchain is among the many changes to the base of the system. Updates to Boost, ICU, x265, Protobuf, Net-SNMP, Qt required the rebuild of a large percentage of the KaOS repositories." The release announcement mentions that Qt4 has been dropped from the KaOS repositories. In the early days of GNU/Linux distributions it was common for Linux users to gather together on a regular basis to swap tips, help newcomers install a distribution, and share media with people who had slower Internet connections. These gatherings were called Linux User Groups (or LUGs). These days many people have high speed Internet connections and can download their own install media, Linux distributions have become easier to install, and tutorials are easier to find on-line. LUGs have gradually become less popular as a result of these changes and we are curious to know if any of our readers are still attending LUG meetings. You can see the results of our previous poll on region-specific distributions in last week's edition. All previous poll results can be found in our poll archives. Madeinlinux was an Italian Linux distribution based on Red Hat Linux.